The mission of Greenville Center for Creative Arts is to enrich the cultural fabric of our community through visual arts promotion, education, and inspiration. Develop your creative skills and discover new art forms in a 6-week class, 1-day or 2-day workshop, or Curate Your Experience in a 2–3 hour group class of your choosing. GCCA welcomes visitors to view exhibitions throughout the year in the Main Gallery, Community Gallery and Studio Artist Gallery. Each gallery space has its own focus, with exhibitions of art by international, national, regional and local artists working in multiple mediums. 12 Studio Artists can be found working in private studio spaces on the second floor of GCCA. Join us the First Friday of each month from 6–9 pm to meet the GCCA Studio Artists and learn more about their work or contact the artist to view work by appointment. Summer Art Camps at GCCA inspire creative learning for kids ages 5–8 and 9–12. Registration opens Friday, March 1 for 2019 Summer Art Camps. 8 weeks of Summer Art Camp begin June 10 - August 9, 2019. The Brandon Fellowship is a 12-month program that provides a creative environment, a network of support, and resources for 3 young emerging artists. GCCA is located in the historic Brandon Mill Cloth Building, a beautiful and interesting setting for cocktail parties and events. 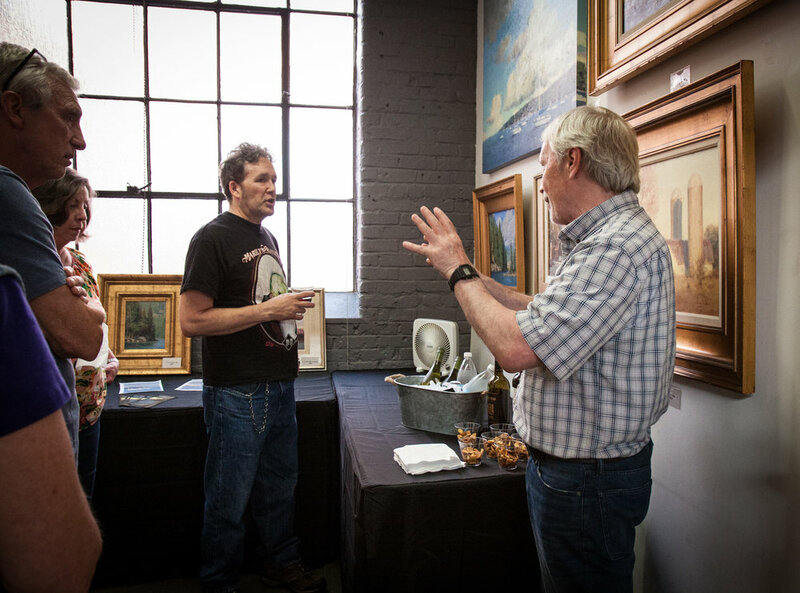 If you are interested in hosting an event at the Art Center, click above to contact us! Greenville Center for Creative Arts is a 501c3 non-profit organization. Your donations and in-kind gifts go a long way to enhance the lives of people of all ages and backgrounds. Click above to donate today! Contemporary Print Collective is hosted by Greenville Center for Creative Arts. CPC fosters an awareness for original hand-made artist prints by promoting exhibitions, educational opportunities, and encouraging the art of collecting prints. Please visit www.upstateprintmaking.com for more information.